We are on our way home today. I just wanted to thank you all for your kind comments and emails regarding my grandfather. It was very sweet and much appreciated. We had a wonderful week together as a family, despite the sad circumstances of our gathering. I feel very grateful for the time we had together. 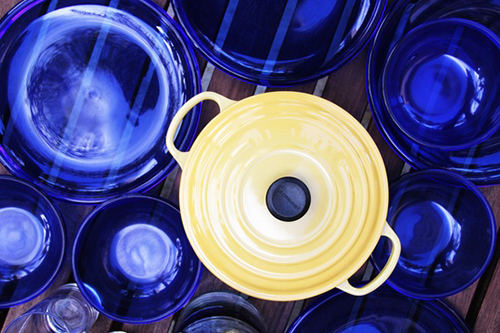 Le Creuset has a new color called Quince, which you can get at Williams-Sonoma. I am participating in a photo contest with other food bloggers to help show off this pretty new yellow. The blogger who gets the most “Likes” on her photo gets to give away a bunch of Quince goodies. Because of this week’s unexpected travel, I forgot to beg you for votes and I’m pretty sure I’m in last place. If you want to make my photo feel more popular, visit this Pinterest page and “Like” it. Thank you! Back to the regular routine for us this week. And with that I turn it over to you! Please share your menu for the week, no matter how simple or fancy! Your family has been in my thoughts all week. I have thought of you often, and prayed for peace in the midst of your grief. sara, thank you so much. that is beyond sweet. and lots of prayers and loves for your little guy, too!!!!! Well here’s to a “normal” week for you! Saturday- out to eat – so many birthday parties this day, we probably won’t be home long enough to cook anything! Sa: Road food…heading Visalia to meet 2 week old twin nephews!!! Thursday -Saturday: Trip to Disney to celebrate Daddy and baby’s (first!!) birthday!!!!! Too much uncertainty with work this week to make predictions on the end of my week. Sat: Homemade Calzones and Salad. can you share the AMAZING cauliflower puree recipe? sounds intriguing! As usual, I just plan 5-6 meals and make what I feel like each day. I work until 6pm, so I have to cook something that can be baked or re-heated by family as they get home. I was just looking at some Le Creuset cookware earlier today. They have this light blue color that is really pretty (I’s a sucker for anything blue or green though, somehow I resisted). Saturday: TBD. out? otherwise red beans and rice? Sunday – Oscar party at the Ambler Theater! nancy – can you share your cauli pizza crust recipe ? i’ve tried 2x now to make cauliflower breadsticks (make crust then top w garlic butter/cheese) and i must be doing something wrong because they turn out very mushy. taste good but consistency bad so i’m afriad to try pizza ! Can you share this awesomly delicious recipe? Duh…nevermind. I followed the link. Here is the week of dinners in our home! this should leave us with plenty of leftovers to tie us over for the week. Liked on pinterest. I know I should be more than satisfied with a full (inherited) set of le creuset pans, they really are fab, but all the new pretty colours make me wish mine weren’t all red! Fri: Hubby’s working late so not sure. Maybe veggie crumble. hillary, thank you so much. I really appreciate it. Sorry to hear about your grandfather, it’s never easy to lose a grandparent even when you are grown! foil dinners ? is this where you put protein and veggies in a foil pack and bake ? i tihnk i heard about these once. they seemed easy for a weeknight meal ? Yeah, for the foil dinners, I use a ground beef patty (whatever size you feel suits you) and then add any veggies that sound good. When we did it last week, I used chopped carrots, chopped red potatoes and sliced red peppers. I seasoned it with a little seasoning salt and Montreal steak seasoning. Wrapped it all up in foil and baked it at 350 for about 45 mins. I’m sure you could also sub a chicken breast for the ground beef. Either way, easy and delicious! great idea ! i love dinners that are in the oven for a short period of time so that i can do other things instead of being stuck in the kitchen ! Yours is far and away the prettiest picture. I’ve been loving looking through everybody’s meal plans for inspiration for some time now, so I figured it’s time I finally share my own! yay! so happy you posted! love it, and LIKED it! Glad to hear your back, it’s always nice to be with family. Even in those times. Well nothing last week worked out, we stayed with grandma, since she was sick. So most of this is a repeat of last weeks Unmade menu. I actually kind of like repeat menu weeks…less thinking! 🙂 hope grandma is doing okay!